For many years, asbestos has been seen as a miraculous mineral. Its tensile strength, sound absorption and, most importantly, its resistance to heat and electricity, made this material appear in all sorts of products, from fire curtains to house and pipe insulation. Unfortunately, at the time, the devastating effects asbestos particles could have on the human body were not widely known, so even to this day, there are millions of houses which still have this mineral. This poses an immense risk to the owners of those properties, as they have great chances of developing mesothelioma, a very aggressive form of cancer. If your house was built before the 1980s, the likelihood that asbestos was used in its construction is extremely high. 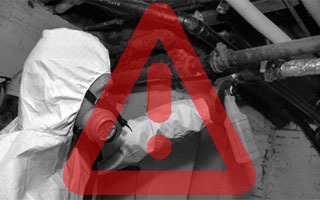 You should hire professional workers to check and see if you are in any kind of danger. The same applies in case you find asbestos somewhere in your house. Do not try to deal with this problem on your own if you are not an expert! Where can you find asbestos in a house and how can the particles be disturbed? As previously mentioned, asbestos can be found virtually anywhere inside and outside your house. Having said this, the most common places are around pipes, boilers, in cement, as well as in roof shingles and wall insulation. Since these products are very old and brittle, it is extremely easy to disturb them and thereby spread microscopic asbestos particles around you. Only trained experts should work on removing asbestos-containing materials. If you believe your house might be at risk of containing this toxic mineral, it is very unwise to begin renovations or to do remodeling. It is important to keep in mind that, even if you do not see asbestos, it does not mean it is not there. For instance, if asbestos was used to insulate your walls, you may discover it only after they are broken, which means you will inevitably inhale the harmful dust. What is the process of removing asbestos? If you find asbestos in your home, it is paramount that you get it removed. Talk to some professional workers and hire them to dispose of it in a proper manner. The room where the material is found will be sealed off. There are cases in which, for safety reasons, the entire house is sealed off in order to ensure that asbestos particles will not escape. Workers will wear disposable full body suits with special goggles and breathing masks equipped with filter respirators. When they begin removing the asbestos, they will work with the utmost care, slowly and precisely, to minimize dust release. The hazardous products will be sprayed continuously with water and non-powered hand tools will be used for removal. Depending on how much material they find, walls, roofs, floors, and other parts of the house might have to be removed or torn down as well to check whether there is more asbestos. After they are done, workers will run a lot of tests to ensure there are no asbestos particles left in the air. After everything is determined to be safe, people can move back into their homes.